Why do You Sneeze When You Have a Cold – What is the sneeze and what is your function when we suffer illnesses in the airway. Any irritation or discomfort in the nasal cavities may cause a sneeze. 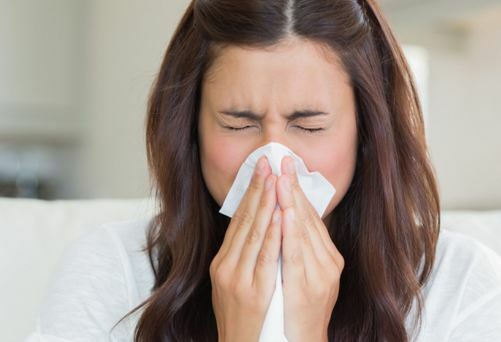 When were cold, nasal congestion is one of the main symptoms. In these cases, the nose gets clogged due to phlegm and the body reacts involuntarily to clean it. Sneezing causes the air to penetrate the nose and mouth to try to dispose of the nuisances. The common cold produces symptoms like sneezing, runny nose, sore throat, and cough. This contagious viral infection affects the upper airways and tends to affect us one or several times during the winter. is it good to sneeze when you have a cold? Unlike influenza, the cold is manifested slowly and progressively and does not produce fever (and, if it appears, is low). The rhinovirus provokes most of the colds. We can suffer the contagion from person to person or by touching contaminated objects with more than 100 different rhinovirus. These have the ability to penetrate the nose and throat and provoke a reaction of the immune system, causing the aforementioned, strong > Symptoms of cold and sudden sneezing. About the triggering factor of sneezing, the most common are the irritation of the mucous membranes of the noses wings. This itch stimulates the terminations of the cranial nerve in charge of administering all sensory stimuli detected by our face. The result is a chain of reactions: we close our eyes, inhale air and contract the muscles of the torso and the pharynx until we expel the air in explosive form and at great velocity. You already know: If you have the flu, cold or allergy, sneeze does well and, moreover, it is inevitable! For the rest of the symptoms, it is advisable to rest, hot beverages and medicines for the cold that provide relief and make you feel better. Previous post How Much Breastmilk does a Newborn Need?